Crowdfunding sites such as Kickstarter have become a funding option for innovators with interesting products that may not see the light of day if they have had to rely on traditional funding methods such as obtaining a bank loan or getting investment from backers. For those with a dream and a viable idea, Kickstarter gave hope. Since its launch in 2009, Kickstarter has since seen explosive growth in the number of projects launched. As of March 2013, the site has debuted almost 90,000 projects, of which around 37,000 of them were successfully funded – that’s a success rate of 43%! “Kickstarter For Dummies“, authored by Aimee Cebulski, is aimed at helping prevent aspiring inventors who intend to leverage on the crowdfunding site from becoming one of the poor 57% who do not finally land enough support to get their projects started. 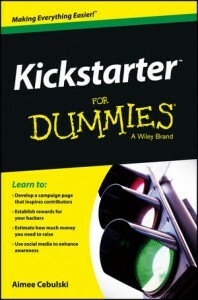 If you have no idea how Kickstarter or crowdfunding works, “Kickstarter For Dummies” will be an invaluable resource. The book will guide you through setting up a Kickstarter account to creating a project, helpfully explaining how to best position your product – choosing a great product image, or writing a compelling description to capture attention – to even working social media to your advantage. Cebulski draws on her previous experience with Kickstarter – once successfully, the other not – and shares how you can establish different tiered rewards for project backers, as well as how to decide on your required funding amount and the duration needed to achieve your goal. “Kickstarter For Dummies” is obviously not for you if you’re already a seasoned entrepreneur with established financial backers. But for those of us with a decent idea that may just get some traction from the crowd, “Kickstarter For Dummies” can show you the way at cracking the crowdfunding phenomenon.